Andre Ingram scored 19 points in 29 minutes in his National Basketball Association debut on Tuesday night against the Houston Rockets. 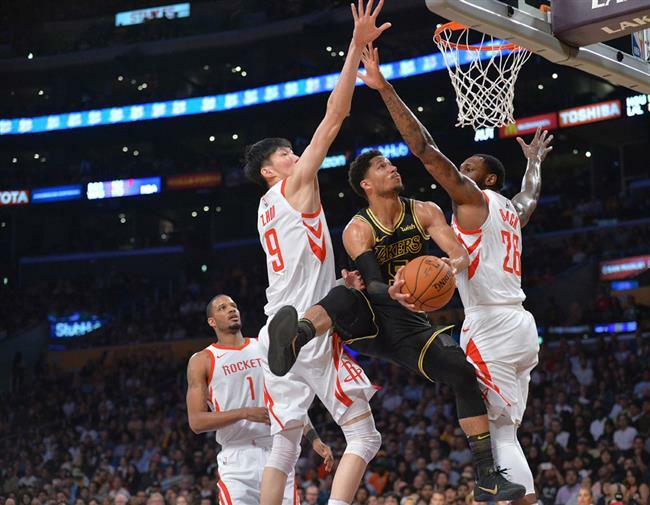 Los Angeles Lakers guard Josh Hart (center) moves to the basket against Houston Rockets forward Zhou Qi (left) and guard Markel Brown during the second half of their NBA match at Staples Center in Los Angeles on Tuesday. The Rockets won 105-99. A 10-YEAR NBA development league veteran, Andre Ingram scored 19 points in 29 minutes in his National Basketball Association debut on Tuesday night against the Houston Rockets after being signed by the Los Angeles Lakers for the final two games of the regular season. The Lakers surprised the 32-year-old Ingram by moving up his “exit interview” from the G League’s South Bay Lakers and having president of basketball operations Magic Johnson and general manager Rob Pelinka on hand to congratulate him. The team posted a video of the moment on Twitter. Ingram has played 384 career games in the development league, averaging 10.2 points in 25.6 minutes per game while making a record 713 3-pointers. He has shot 46.1 percent from beyond the arc in his career , including 49.2 percent over the last three seasons. He spent the first four years of his career with the Utah Flash, the Jazz’s affiliate, before joining the Los Angeles D-Fenders, who became the South Bay Lakers when the league was rebranded as the G League this year. This season was his sixth in Los Angeles. The Lakers need rotation players with Lonzo Ball, Brandon Ingram and Kyle Kuzma all battling injuries. Ball (knee contusion) and Ingram (concussion) are not expected to return this season. Kuzma (sprained ankle) was ruled out for Tuesday night’s loss against Houston and is unlikely to play in today’s season finale against the Los Angeles Clippers. Chris Paul warmly greeted Ingram when the 32-year-old guards both arrived at the Staples Center scorers’ table to check in. Although they were born six months apart, Houston Rockets’ Paul was in his 892nd regular-season game.